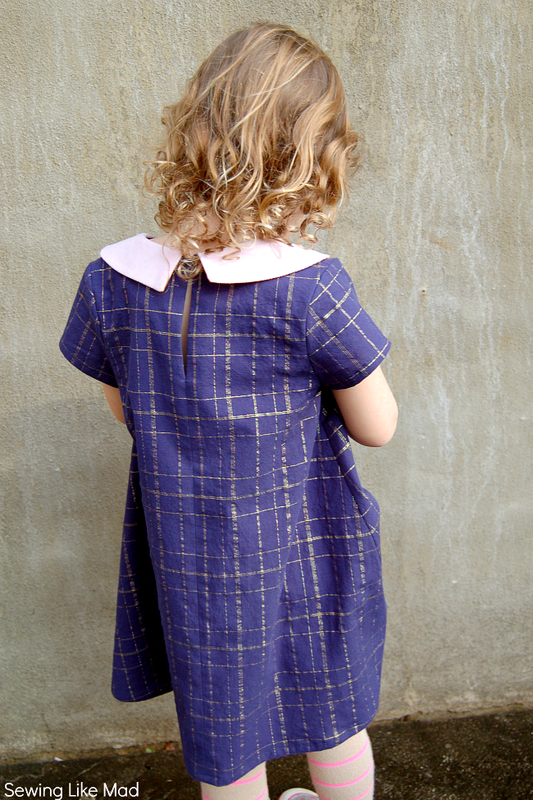 Sewing Like Mad: The Norah Dress by Mouse House Creations. 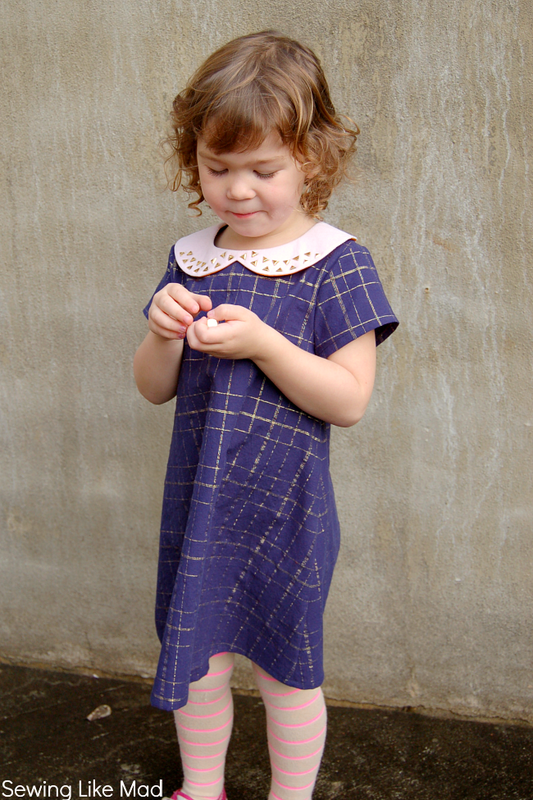 Today I am participating in my friend Hayley's tour for her first children pattern release, The Norah Dress. She blogs at Welcome to the Mouse House and is also known as the human tornado - okay she is not exactly a destroyer but she must move very very fast with all the things she has going on. 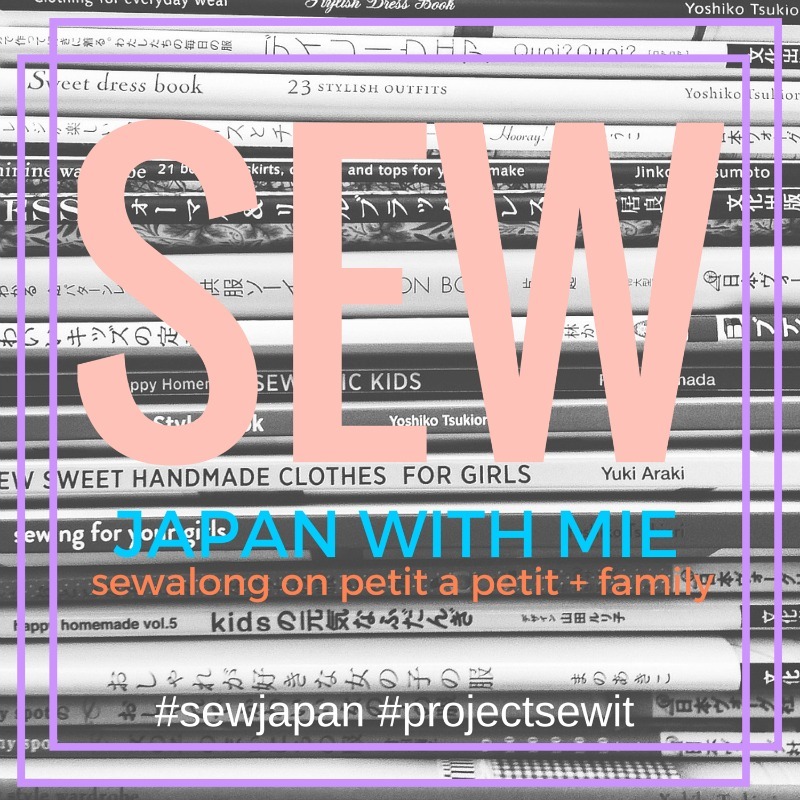 Blogging about sewing, crafts AND interior design, articles i magazines, patterns, competitions (which she usually wins) and the list goes on and on. Phew, amazing! 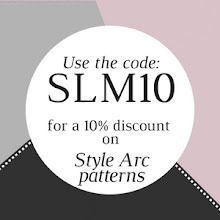 It is a super versatile pattern with several neck decoration options. You can see the options and tons of inspiration in THIS post. It is fast and easy to sew and with a slit opening in the back neck making it suitable for beginners too. I made it with this navy skirting cotton with sort of a woven gold plaid. My fabric and collar decoration came together in the most random way. I originally cut the dress in a cute deer printed knit from Spoonflower and was planning on the baby pink collar with orange cotton voile as the inside fabric and a navy blue cotton voile tie. Well, Evelyn hated the deer print (oh great) so I decided to skip making that version for this tour (I mean what is the chances of getting any, as in any at all, photos in it, right!). SO next this fabric caught my eyes on my shelves and OH that baby pink collar looked nice with it....and wait those gold iron-on triangles, I bought the other day in Jo-Anns, were sort of perfect for decoration of the collar. And here we are with a dress I absolutely LOVE. And so does Evelyn - after the photo shoot that had to be done with a heavy intake of mini marshmallows - kiiiiiiids, argh. She actually ended up sleeping in the dress too that night. Here is a closer look at the collar. The iron-on triangles were super easy to work with and well they survived first wash - so far so good. Iron-on things usually stick pretty well to corduroy because of the fuzzy surface. 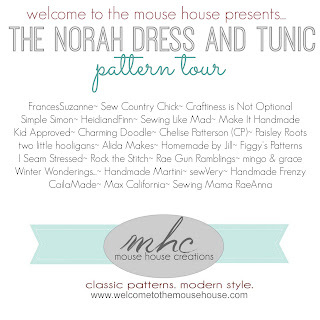 Please, do also make sure to check out what all the other amazing ladies in this tour have made with their Norah pattern. A click on the button below and you go to Welcome to the Mouse House where there will be teasers and links to all the blogs participating. Thank you for inviting me Hayley! This is so beautiful. The main fabric is gorgeous and I love the collar. Those iron on triangles are such a great detail, when I first saw them I thought they must be metal and that you'd pressed them in. super cute mie! and i know 2 little girls who will take that deer one if she never wears it! I will be searching JoAnnes for those gold iron on triangles. I can't tell you how much I love them! The whole dress is so great. Thanks Trine. I KNOW! There is a lot of sewing supplies stores you could use in DK, right! This is so cute, Mie! Love the color and the fabric. Evelyn looks so cute. I am happy she loved it! Thanks Olga. Yeah, this is a good one! It does really suit her. 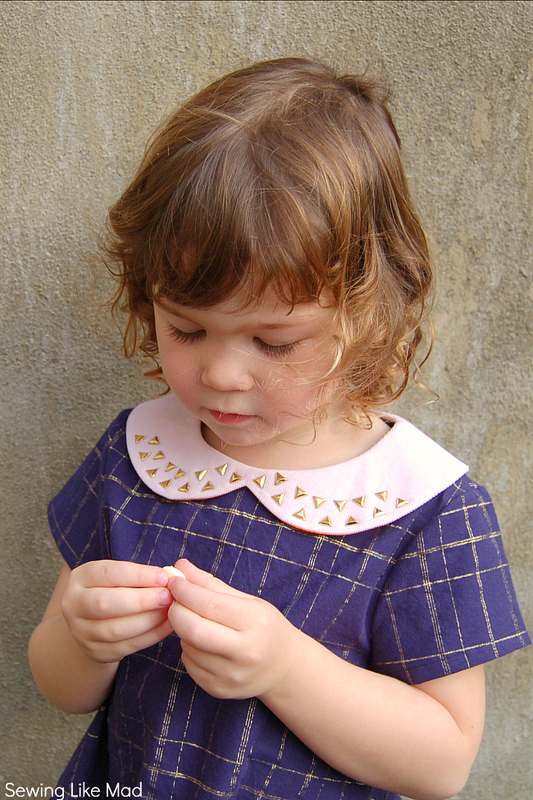 Gorgeous and love the embellishment on the collar. Where did you find the triangles at Joann's? I need some of those. I loved your uber-christmas version too! The photos are amazing! Shhh don't tell anybody but I think this might be my favourite Norah dress yet! I love your colors and fabric choice. I would totally wear this and so would Elsie! I might have you ship me some of that hardware ;) Amazing as always!!! You are one of the most amazing people I have ever "met" and I just can't thank you enough for taking the time out to join in on this. not only do you have impeccable style, but you just have such a way with sewing that makes it so incredibly unique and fantastic. Thank you so much Mie! I means so much to me! Looking good Mie! I'm glad I'm not the only one whose kid sleeps in her handmade dresses! 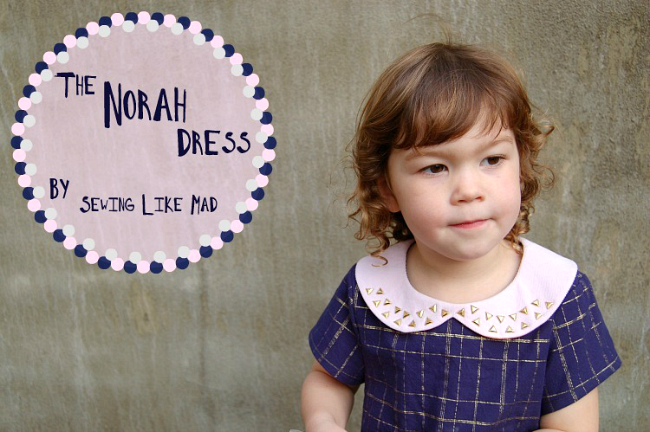 Love your Norah, and the collar is so rad!